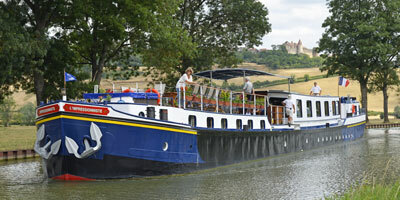 Welcome to our exclusive collection of hotel barge cruises. For over 35 years, we have specialised in creating luxury barge holidays on some of the most beautiful waterways in Europe. Far removed from the hustle and bustle of city life, these voyages allow you to travel in luxury without the strains of packing and unpacking, whilst enjoying a balanced blend of daily excursions and fascinating cruising. 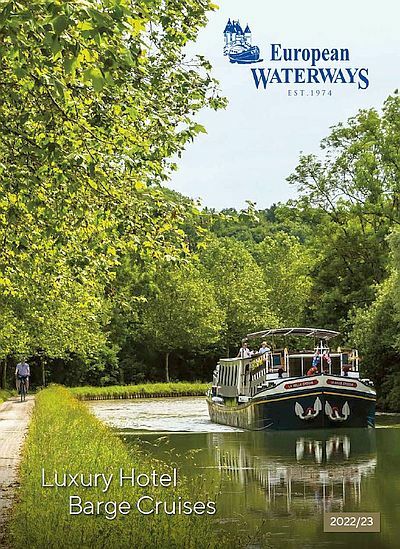 Established in 1974 and operating cruises since the early 1980s, European Waterways has a wealth of knowledge and experience to share with our clients. Still in the same private ownership of the Directors who run the company, our guests can be assured of consistently high standards of personal service, and vast experience of our markets. We have vessels available for up to 20 passengers with cabin sizes varying from cozy and compact to ultra-deluxe staterooms comparable to top hotel rooms. 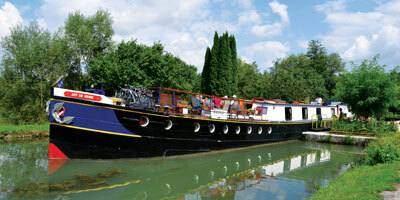 We offer the widest choice of destinations of any hotel barge company. Cruising areas range from the Midi in Southern France to the Scottish Highlands and from Ireland in the West to Venice in the East. Many of our guests book with us over and over again and also recommend us to their friends – which is the best endorsement that a travel company can hope for. See some of their comments on Feefo, below. Our crews are trained to provide the highest levels of service whilst making you feel totally at home. Our office staff will equally guide you effortlessly through the process of booking the holiday of a lifetime. Our vessels gently introduce you to some of Europe’s finest scenery, fascinating history and local culture. Every European Waterways six-night barge cruise includes all gourmet meals, regional wines, an open bar, local transfers and the use of on board facilities such as bicycles to explore the towpaths, a sundeck to laze on, or a spa pool to relax in. 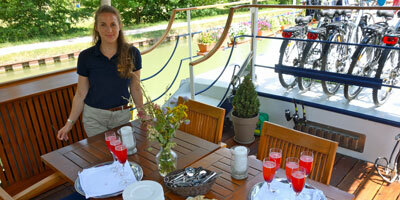 We also offer daily escorted excursions “off the beaten track” to wineries, castles, markets or to see craftsmen at work. Discover the fascinating world of barging, through the vineyards of Burgundy, on the shady Canal du Midi in Southern France, the historic Po Valley in Italy, or the River Shannon in rustic Ireland. Navigate the Royal River Thames, through the stunningly rugged landscapes of Scotland, picturesque Alsace & Lorraine, or the colourful tulip fields of Holland. 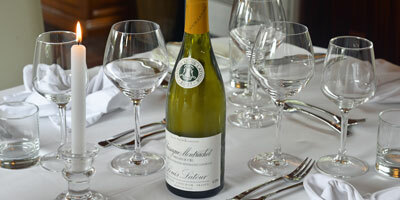 The wine-growing region of Burgundy lies at the very heart of rural France with a rich and unique history. The Midi – a land with a rich heritage – diverse Mediterranean landscapes, sun-drenched vineyards and Cathar fortresses. 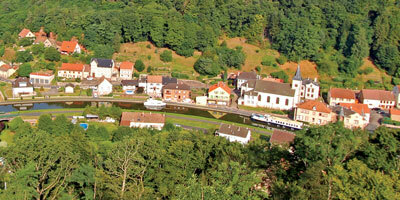 A unique blend of French and German cultures, forested hillsides, storybook villages and wonderful white wines. A peaceful region of colours and flavours, of orchards and vineyards, where we get a taste of the real France. A region of vividly colourful landscapes, wonderful gastronomy and a ‘terroir’ that produces world-renowned wines. A mosaic of forests, vineyards and rolling cornfields beneath expansive skies – home to the eponymous sparkling wine that all the world knows and craves. The captivating waterways of the Veneto and the Po Valley, combined with the history and culture of Venice and its hinterland, offer a rare cruising experience. An dramatic land of mountains, glens, battlefields and whisky, with deep and mysterious lochs that reflect the legends of the past. England’s Royal River Thames offers you castles and palaces, peaceful meadows, quaint country villages and waterside pubs. The Emerald Isle offers lush green pastures, history and folklore and a welcome to surpass all others. There are so many delightful watercourses to be discovered – canals like the Briare, Nivernais, Burgundy and Canal du Midi in France, the Caledonian Canal in Scotland and the Bianco Canal in Italy; majestic rivers such as the Cher, Moselle, Shannon and Thames; and the more open waters of Loch Ness, the Etang de Thau and the Venetian Lagoon. Some vessels in our fleet are owned by us, others by experienced operators who maintain similar standards and have been vetted by us. On board all of them you will glide serenely along waterways that pass through magnificent countryside; be taken on fascinating local excursions; indulge in delicious meals, fine wines and comfortable accommodation – whilst all the time being pampered by your attentive crew. We can arrange a wide selection of themed charter cruises which will appeal to all types of interest groups, large or small, including golf, walking and wine appreciation themed cruises. Despite the growing popularity of cruising, especially on large river vessels, hotel barging is still a little known niche concept. Our Italian holidays afloat will let you discover that country’s hidden beauty! There have been many interesting and entertaining articles written by journalists and travel writers from across the globe about their journeys on our luxury hotel barge cruises.